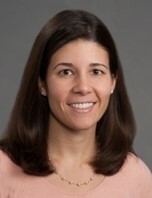 Kristen M. Beavers, PhD, MPH, RD, is an Assistant Professor in the Department of Health and Exercise Science at Wake Forest University where she teaches Nutrition in Health and Disease (HES 351) and Epidemiology (HES 360). Dr. Beavers received her BS from Cornell University in Human Biology, Health and Society; MPH from The University of North Carolina at Chapel Hill in Nutrition; and PhD from Baylor University in Exercise, Nutrition, and Preventive Health. She is a Registered Dietitian and certified by the American College of Sports Medicine as a personal trainer. Dr. Beavers’ academic and professional interests lie in the study of nutrition and exercise as interdisciplinary sciences, specifically as they relate to prevention and etiology of chronic disease and disability. Her research focuses on the identification of optimal weight loss therapies for overweight and obese, older adults.